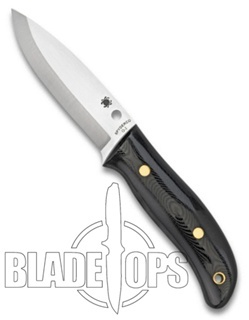 The Spyderco Bushcraft knife follows in the tradition and sport of Bushcraft. Bushcraft is the regimen of survival skills that originally come from the Bushmen of the southern hemisphere. This Spyderco knife is a three fold collaboration between Tactical Bushcrafter Chris Claycombe, a Bushcraft website called BushcraftUK.com and Spyderco designers. A Survival Knife such as the Spyderco Bushcraft gives you some of the best of all worlds. The blade is the perfect length for the outdoors–it is large enough for chopping and slashing if the need arises, but not so large as to make it difficult to manage small sized tasks as well. The blade on the Bushcraft is full tang with a Scandanavian grind. The Scandi grind is a single bevel grind that is wide and flat. The Scandi grind cuts with strength and doesn’t succumb to the twisting and hacking that many other blade grinds will. The O-1 tool steel of the Bushcraft blade has a high carbon content that will hold an edge–but it also is relatively easy to sharpen when the time comes. One of my absolute favorite things about the Bushcraft from Spyderco is the contoured G10 handle. This is possibly the most comfortable handle I have ever found in a fixed blade knife. It makes your job a whole lot easier–not only is the knife easy to hold onto, but it actually is comfortable enough that you don’t suffer fatigue. The Bushcraft excels at “slicing, chopping, whittling, and game processing”. It is the kind of knife that makes life better when you are outdoors. Get yourself a Bushcraft, and then you will see what I’m talking about. Previous Previous post: What is your favorite EDC?